→Berndes SignoCast Classic Cookware Set Review – Should I Buy ? When you want to cook nutritious and adventurous meals for the family, you need a hard wearing and highly versatile cookware set in which to do so. With so many different brands and metals to choose from, it can be increasingly difficult to know what the best cookware sets are to buy. You really need to choose a set that matches the needs of the family and that is within your price range. Below we offer a full review of the Berndes SignoCast 10 piece aluminium cookware set. The following are the most features of Berndes SignoCast Classic10-Piece Cookware Set. 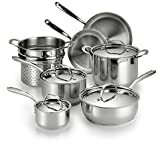 This versatile cookware set is made from high grade aluminum that is particularly strong and durable. This metal will not warp at high temperatures and will not easily mark or become damaged with use over time. Even though strong, the sides are thin with a thick base, resulting in a lightweight pan. Aluminium is also a fantastic conductor of heat and therefore heats food quickly and thoroughly, resulting in no hidden hot spots of food. 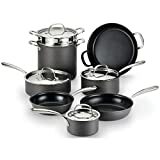 The pans within this cookware set have been constructed with a nonstick surface. This is on both the interior and exterior of the pan. It is guaranteed not to peel, chip or to mark over long use. This nonstick coating ensures that pans are easy to clean after use and also help to protect the aluminium interior. The nonstick coating also means that no oil is needed for cooking. This results in healthier cooking and a quicker cook time. There are four glass tempered lids with this set, that fit their respective pans. 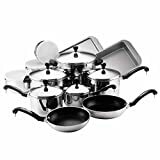 They are very safe to use, are shatterproof and are safe for use up to temperatures of 450 degrees F. The lids fit snuggle and are heavy in weight to help add stability to the pan while it cooks. The tight fit also ensures no los of nutrients and food cooks more quickly . The beauty of the glass lid is that you can see the progress of your food as it cooks. All of the handles in the set are long looped for easy grip and comfort. As they are long they are extra safe as you can pick up the pan at arms length to avoid scalds and splashes from hot food. The handles are also designed to stay cool to the touch even when placed on a hot stove. They are also safe up to temperatures of 450 degrees F. The knobs on each pan are large and easy to grip. They have also been designed to stay cool to the touch, so you can safely removed lids from a hot pan. 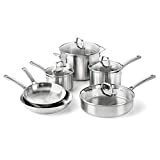 The set features the following; a 9,5 inch skillet pan; an 11 inch skillet pan; a 2.5 quart sauté pan with matching lid; a 1.25 quart sauce pan with matching lid; a 2 quart sauce pan with matching lid and a 10 quart stock pot with matching lid. All of the cookware is safe up to oven temperatures of 450 degrees F. All the cookware can be used on electric, gas, ceramic and glass stoves. The cookware is not safe for use on induction cook tops. Q. Can this cookware be used on ceramic cooker tops? A. Yes they are perfectly safe on electric, glass, ceramic and electric cookers. Q. Can you use metal utensils with this cookware? The Berndes SignoCast high grade aluminium cookware set is highly versatile, easy to use and easy to clean. It can be used on the stove and oven and on a variety of appliances. As it is nonstick, you need no oil to cook with, so it provides a much healthier way in which to cook food. With stay cool handles and glass lids that fit securely, this cookware set is good value for money.